I am always looking for deeper meaning in things, events, people, rainbows, dog expressions, words… So when a I come across a novel definition of an every day word like photography (writing with light) or ego (edging GOD out) or faith (Fully Anticipating It To Happen), I stop and think.. this moment has meaning. What is it? It’s amazing what can come up when you go through your days with so much curiosity. We were out cross country skiing just a few hours ago, the sun was out, but rain was falling somewhere nearby, I could hear it.. I thought.. or I should say I HAD FAITH that a rainbow would appear, and in that moment, yep.. up shot a rainbow over the trails ahead. No, I didn’t see a unicorn, but I have to say that this in-the-moment awareness can be pretty powerful. Try it.. and let me know what you experience! HO HO HO ..or.. NO NO NO! I’m finally owning this fact: This December holiday season confuses me. I’m not a holiday craftsperson. I’m not a baker. I’m not a sender of Holiday cards. I dislike shopping malls. I do not go to corporate holiday parties (any more). Yet, I AM joyful person. I do love giving meaningful and thoughtful gifts. I do love decorating the tree, plugging in the outside lights.. So why does this season always feel so challenging? I have a theory: I’m letting the “holiday stress” in. It’s not mine! It’s all around me, but I won’t own it. I know it has to do with old narratives, missing pieces, false nostalgia, hyper consumerism, and overfull calendars. I’m a solution-finder, so after sitting down for way too many hours today, trying to find my way through this holiday commitment slog, I’ve found my solution: Be present, limit social media, be love, and stay fit. Many of my clients are feeling the same, so I’ll share some thoughts for you, and me! Oh, since I have to get to the gym, I borrowed these from the Mayo Clinic ;-) Please, be happy, healthy and joyful! Your To-Do list just exploded… It must be holiday season! It’s common for many of us to idealize the holidays… until they start to show up as all the things we’ve committed to complete/attend/buy/wrap/send, etc. Yes, “ ‘tis the most wonderful time of the year”, but it seems like many of my friends and colleagues manage to miss the wonder of it all … due to holiday overwhelm. If this resonates for you, below I will share some different types of lists to keep for the next several weeks. If the ideas herein don’t really work for you, then I’d like to suggest choosing just one word – your own focus word - to serve as your mantra for enjoying these activity filled days ahead. Can’t come up with your holiday mantra? How about charity? Joy? Generosity? Grace? Belonging? Friendship? Pick one word that makes you smile, and breathe it in and out when the stress meter starts moving towards the red zone. The barrage of holiday advertising tends to make us feel that we don’t have what we need, that somehow we’re not measuring up in one or many areas of our life. This “scarcity mindset” afflicts you at home and at work, and can leave you feeling unsuccessful, unsatisfied, lonely.. or sometimes even hopeless. No wonder mental health professionals report a spike in clinical depression during this season! Try making a list of what’s going well with you and your business/job right now. Make sure you recognize and note your own super human strengths; even if it’s dragging yourself to a job you don’t love (that takes fortitude!). You can address change in a meaningful way next year, but noting what you love about your current daily life, your family, your inner strengths, your outward accomplishments, your grit, even your ability to make someone smile.. it’s all worth noting on this list. Once you start making a habit of noticing what’s going well in your life, you’ll experience a sense of calm, relief, empowerment; and you will build trust in your capability to create what you want in your life. Why not start today? You can make a single list, or come up with a fresh list each day. When we feel overwhelmed, we can experience mild (or acute!) anxiety, which shuts down our natural ability to focus on what’s working in our lives. Challenges and problems feel enormous, insurmountable … almost like we need to scale an entire mountain standing before us. Rather than focusing on what you can do, you shut down because you can’t scale it all at once, there’s just no obvious route. Let’s start by simply renaming your holiday list your “can-do” list. This already sets that stage for moving forward. After identifiying all that you want to accomplish over the next several weeks, think of positive situations where you regularly experience literal forward motion, such as walking, running, stretching, etc. Try to imagine what that feels like. Now, think of other activities and projects which are regularly a part of your days, like reading certain periodicals, filing a status report, connecting with colleagues, planning a vacation. Literally close your eyes, and think about how you are moving forward, getting these meaningful things done, crossing them off your list. Now, back to that holiday can-do list: Pick one activity that brings you joy, break it down to measurable increments, and do something to check it off. Keep building on the positive momentum that you gain from this activity and move forward some more. For example, let’s say you have an intention to plan a holiday gathering with clients but can’t find the time or resources to organize it (..Who would love to be included? Shall I use evite or the newest online event app? What if I pick a date when too many can’t join?... ); imagine simplifying your approach, then harness your sense of forward motion, and just make a date with a colleague or client to enjoy a holiday meal together. Who knows, others may just organically join. There - holiday gathering - done. As you achieve more, you’ll discover more positive approaches, and your attitude will shift from overwhelm to accomplishment and flow. As the year draws to a close, we tend to focus on all we didn’t actually accomplish, despite our best intentions set at the beginning of the year. Rather than letting our attention shift to what we didn’t accomplish, and how little time you have left to get it done, try instead to notice what did work well. What strengths did you lean in to? How can you leverage those strengths as you think about what you want to accomplish today, this week, next year? Did you learn some important life or business lessons? Try to conjure up the expected and unexpected wins. Try to bring some focus to those days when life moments just felt good. What were you doing? Who was present? What did you do that day, so that you could enter into that state of authenticity and flow? Focusing on these positive signals will lift your mood, help you to feel excited anticipation for the upcoming year, minimize the holiday overwhelm, and ideally help you to truly enjoy this most wonderful time of the year! I love podcasts, in fact I would say I'm a podcast addict. This is how I justify my hours logged driving between where I LIVE and where I CONNECT. On a recent trip, I was thinking about how all of this driving was really feeling like a worn out life pattern, then stumbled across this podcast called "Remote Possibilities" - which is about how to set up a remote business, anywhere is the world! Why, I thought, do I feel that I need to drive 400 miles every other week to find connection? With that, here is my first blog post, it's really about what Pema Chodron refers to as "staying".. settling down to find out what's inside... to explore the remote possibilities. As a relatively new resident of Tahoe City, I am relentlessly curious about the people I meet here, and how they found their way to calling Lake Tahoe their home. I have been consistently surprised to meet such a variety of people - creative professionals, health practitioners, biologists, tech entrepreneurs, “joy surfers” and more.. I have to admit that this richly diverse and spiritually minded community feels like a very agreeable alternative to the somewhat less diverse (and more intense!!) community of people I’ve aligned with in the SF Bay Area. Not to sound judgmental, but I am finding the variety here to be, well, much more aligned with what matters to me. The centerpiece of our lives seems to be common - the heart-stopping beautiful surroundings, limitless ways to enjoy the outdoors, the simple pleasures. 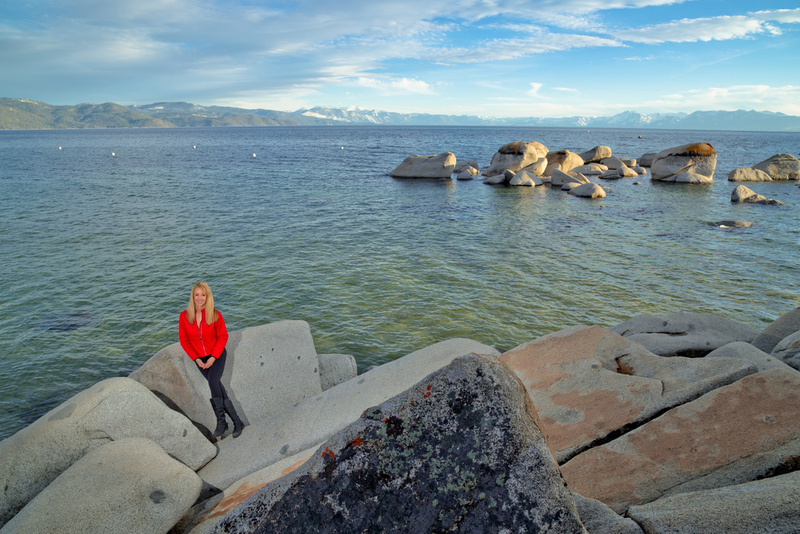 Over the course of the past 15 months, my husband and I have been vacillating about whether Tahoe is where we want to call our permanent home. We have been subject to the same range of emotions that multigenerational locals experience with unpredictable seasonal weather patterns, over-crowding, proper dog management, and more. We have volunteered for local athletic events, high school sports team coaching, ski mountain hosting, and look forward to more of the same in the coming summer. But still.. we wonder, "is this home?" I continue to drive back and forth to the Bay Area for meeting with my coaching clients, keeping my professional and personal relationships from becoming stale, and burning way too much fossil fuel. This is way out of alignment with my environmental politics. So, I’ve decided to try and pivot to my new mantra for living.. really LIVING.. up here: Remote Possibilities. It IS possible to be a fully deployed leadership and life transformations coach in Tahoe, I just need to practice what I preach.. to truly see the possibilities, to leverage technology (remote connection! ), to meet and get to know my neighbors, to refine my coaching practice so that it meets the needs of my local business and personal connections, and so on. Bottom line: It’s easy to be on the run, halfway here or halfway there. It’s harder to be still, to make a stand.. until you do. In stillness, the truth comes at you, so you have to be ready! For me, my new possibility is: This (Tahoe) is where I LIVE, where I WORK and where I PLAY. Trips to the Bay Area are lovely, but also a way of avoiding the possibility to grow in so many significant dimensions.